Scholarship Student, Nora, and her sponsor, Mary Catherine. For over 20 years, FOCES has sponsored small Prayer & Action, Youth, and Healing Delegations to work hand-in-hand and stand in solidarity with people in some of the most impoverished communities in El Salvador. FOCES Albuquerque partners with FOCES El Salvador in order to understand the needs of the communities and how to best support them. FOCES has been a ministry in two Roman Catholic parishes in Albuquerque (Aquinas Newman Center from 2000-2012, St. Therese 2012-present), which has helped tremendously in furthering our mission. Although the delegations are faith-based, there is no religious requirement to participate in delegations or to sponsor a scholarship student. A Prayer and Action Delegation is composed of a group of approximately 3-10 adults who have been selected through a basic application process. The Delegation meets for several months in advance of the trip in order to prepare, fund raise, learn about the history as well as current political & economic struggles in El Salvador, and the life and martyrdom of Archibishop Oscar Romero. Pre-delegation activities help members to get to know each other and unify before traveling together. Each delegation chooses a specific project to support from a list of suggestions developed by the communities themselves. Past projects include building latrines, building a school, renovating a soccer field, and furnishing a ‘safe house’ for students to live in while they attend university. While in El Salvador, the delegation visits historically significant sites, such as the church where Archbishop Oscar Romero was martyred, learns first-hand about the 13-year civil war from those who fought in it, and visits the small communities where they meet with campesinos and work on projects. Periodically, FOCES sponsors a Healing Team Delegation. 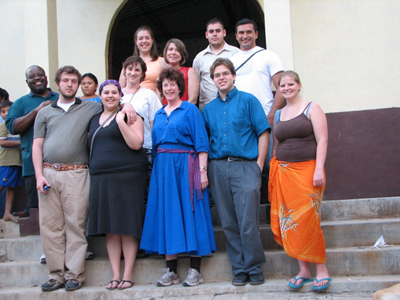 Members of the Healing Team Delegation must have previously visited El Salvador as a member of a Prayer and Action Delegation. Healing Teams work in communities identified by FOCES San Salvador to help with emotional and psychological traumas, or medical needs, depending on the skill-sets of the delegates.